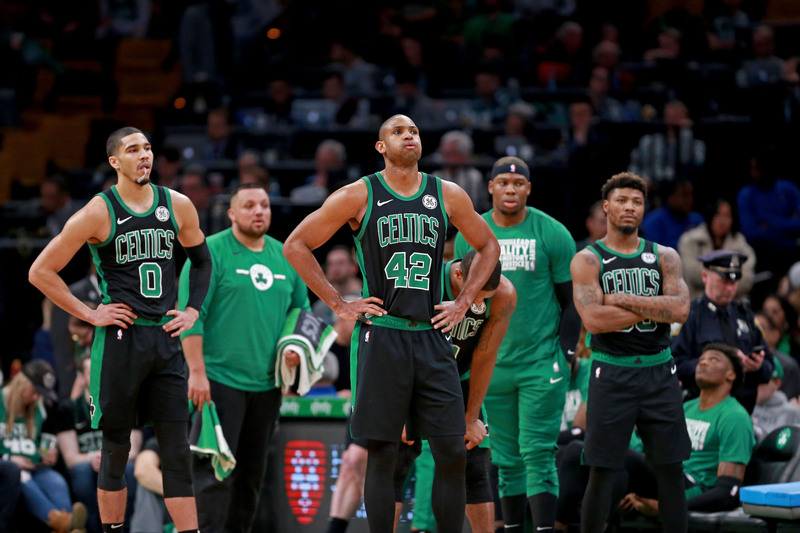 Earlier today, Dom already hit you with a reaction piece from last night’s debacle north of the border, and I could not agree more with his overall assessment: this Celtics team is displaying ZERO passion, heart, or drive right now, and it’s kind of hard to see them playing much past April this year. A five-point loss at home to Golden State at the end of January after turning the ball over 14 times and missing key opportunities in the game’s final minutes. A tough one-point loss at home to the Lakers on February 7th. An inexcusable 10-point loss to the Bulls – the 16-45 freakin’ BULLS – this past weekend, during which they allowed Zach LaVine to somehow score 42 points. I feel ya, Brad. WTF??? I’ve complained on numerous occasions about the team’s maddening inconsistency this year, both as a unit and from an individual standpoint. While Jayson Tatum, Al Horford, and Marcus Morris have each put up some points this season, the only truly consistent player, night in and night out, in terms of scoring the ball has been Kyrie Irving (minus last night’s seven-point performance). Even through all the drama, Kyrie is still getting it done. It really is a crapshoot as to who is going to show up for the Celtics each night otherwise, and much of that has to do with the fact that everyone is fighting for a role on a completely overcrowded roster. Most of the time, teams are happy to have such an “embarrassment of riches,” but there’s also a lot to be said about the whole “too many cooks in the kitchen” adage, too. Just look at last night against Toronto, for example: Brad Stevens used 11 guys in total – with nine of them receiving at least 20 minutes of action on the floor! In comparison, the Raptors used 13, BUT only five guys saw over 20 minutes, with two of their best receiving over 30. That’s how it should be: Use your best guys a lot, and let everyone else settle into lesser roles. Enough of this little-league style, “everybody gets to play” B.S. It’s now almost March. If this team has any chance of making a run this season, Brad needs to buckle down and tell his guys to stop chirping, play harder, and learn their role. If you can’t take over a game, then take a back seat. But what really struck me last night was the continuously deteriorating attitude and psyche surrounding the team. This, folks, is what will be the team’s Achilles’ heel. Nahhht a great look there. Brad also blatantly called the team out after the game and said they were “taking shortcuts,” particularly on defense. And thereeeee we have it. That’s the problem: this “team” is just simply not a team right now. “It’s going slower than we expected,” Marcus??!! Dude, there’s a month and a half left in the season. WAKE UP. Unfortunately, this not an easy thing to fix. It’s also not something new nor an issue that anyone should find surprising. With Kyrie running his mouth all year long, younger players like Jaylen Brown clapping back at him, and others throughout the roster looking like Gloomy Gus in multiple media clippings this year, all we were waiting for is a quote like this to give us vindication. OH, and now the coach is joining in on the melancholy, too? AWESOME. Alas, this is the NBA, and hot streaks can happen. I could be sitting here in three weeks looking like a moron if Brad tightens the rotation, lets the talent take over, and tells anyone who doesn’t like it to pound sand. After all, they’re still a top-five defensive squad and possess the star power to be a force when they want to be. But with games against Portland, Houston, Golden State, Sacramento (twice), and both L.A. teams over the next two and a half weeks, how many people feel confident that will happen? Yeah, that’s what I thought. Wake me up when the boys are ready to act like men, and maybe we can do something here. Until then, I’m putting the children in time out. This entry was posted in Celtics, NBA and tagged Boston Celtics, Brad Stevens, Celtics, Kyrie Irving, Marcus Smart, NBA. Bookmark the permalink.